If using the Trackmobile, Caboose Rebuilders can be built in as little as 30in long in HO scale. But I would suggest building it at 33in to 36in long (10in wide) so that you can bring in an occasional 50′ box or flat car with parts. 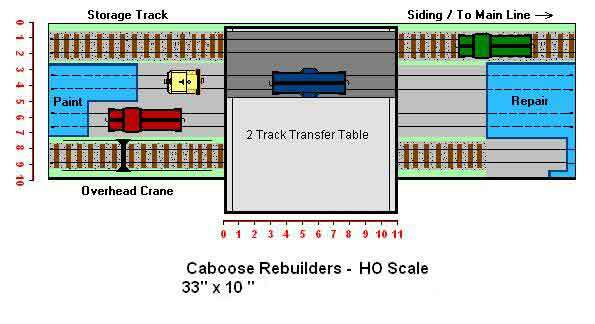 Caboose Rebuilders takes advantage of a two track transfer table. Rather than hiding the transfer table, which happens a lot in micro layouts, this layout makes it the centerpiece of the action. The two track transfer table acts as the run-around. The small layout actually provides quite a bit of switching. Typically a caboose would need to go to the repair facility first and then would need to be run around to get to the paint shop. Another run-around is required to place the completed caboose back on the siding to be picked up. Cabooses can be in various states of disrepair, some in primer, some with dents down the side and some with brand new paint should be used. Different road names and different types of cabooses may be present also. At the front of the layout is an overhead crane where a few old wheel sets can be placed. Originally I had in mind an EMD Model 40 but the Trackmobile is even better suited to this type of facility!